Forward thinking is what smart planning is all about. Whether you are planning a trip, a project at work or just deciding what you are going to do for the holidays you have to imagine the future. For instance, when planning a trip you need to think about the final destination. Then you can think about all of the places you want to see when you get there. Some of us are detailed planners and some are not. Some people have a destination in mind and just take off. For short inexpensive trips that might work out but if you are going to be gone a long time and spend a lot of money you will probably want to do more planning. Generally, the longer the time period and the more that is at stake, the more planning you should do. 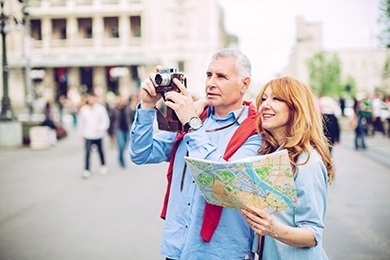 The same process that you use to plan a trip can be used to plan your financial future. You must imagine the future and really think about your destination before you start that long trip. The destination for most people is retirement. Some day, most of us want to stop working and do other things. Forward thinking and imagining what we would like to do later in life makes planning and the steps you need to take to get there much easier. Everyone is unique. If you have ever tried to plan a family trip you know. It’s hard to please everyone all the time. Compromises have to be made. The perfect vacation takes some planning. No two individuals have the exact same idea of what retirement should look like either. But you need to start somewhere. You need to say retirement is the main goal. Make a list. When we retire we want to – and fill in the blank. There can be more than one answer. Prioritize your goals. Then imagine a perfect day after you retire. Where are you living? What gives you the most satisfaction? What would you do first thing in the morning? What does that perfect day look like? What are you going to do to fill your days? A great retirement doesn’t happen by accident. Yet there are many Americans who just live for the moment and others who think that planning is a waste of time given their situation. These people do not see that the little decisions they make everyday can have a huge impact on their future. You need to make retirement your destination, your primary goal. I don’t think anyone imagines getting up at 5am and going to work at a fast food restaurant when they are 65. I may be exaggerating a bit but the choices you make now dictate the type of retirement you can have. If you don’t save aggressively and start early it severely limits your retirement choices later. The longer you wait the less flexibility you will have. Do you want to have to work when you are old because you don’t have any choice? Most people would say no. There are many smaller goals you may want to plan for but they cannot put your retirement in jeopardy. Uncertainty increases stress and certainty decreases stress. Knowing is usually less stressful than not knowing. Doing things impulsively increases stress and making thoughtful decisions decreases stress. Once you go through the steps and start making smart choices you will notice a great reduction in stress. For most people the reality is that life happens. We get mired down in living day to day and it’s hard to imagine the future and think about financial matters. So many people just let life happen to them like they have no choice. Then they wonder why they are running faster and faster and getting nowhere. But you do have a choice. You can choose to do what everyone else is doing or you can choose to do what it takes to secure your future. You need to stop and take the time to do a little forward thinking and smart planning.